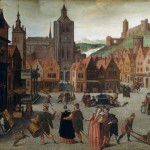 Able Grimmer was born in Antwerp before 1577 and died there around 1619. Sources offer conflicting opinion whether Jacob Grimmer was his father or grandfather but agree that Jacob influenced Able’s work. Able Grimmer is known for his paintings of genre scenes, religious subjects and landscapes. He is perhaps most well-remembered for his landscapes depicting the general populace at work or leisure. 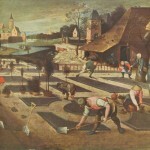 He work was influenced by Pieter Bruegel the Elder. Bruegel defied convention which tended to place religious associations within a landscape and instead depict the landscape more like it actually appeared. Grimmer would appear to have taken that concept a step further. Many of his works depicted the seasons. 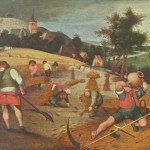 The same setting would appear in more than one piece but the painting itself would provide clues as to what season was being depicted – ice skates in winter, hay harvests in the fall, etc. Grimmer would become a master in the Guild of St Luke in Antwerp in 1592. Many of his works are directly copied from or obviously inspired by the work of others. Grimmer adopted several techniques which decreased his production costs and thereby provided a source of lower-priced paintings. 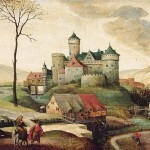 His oils rivaled the costs of prints and were therefore quite successful in the marketplace. While his works were often based upon the vision of others, historians agree that Grimmer was able to develop a style uniquely his own. Rembrandt no doubt admired Grimmer's work and may himself have been influenced by him as it has been said that he had in his possession a work called “winterje” by Able Grimmer.